December is here again. The month that always reminds me of the critical model for living a good life, which my friend, Sophat, described as the 3 E’s: engage, evolve and experience. When I first heard about this model, I personally found it rather therapeutic, if not life-changing. Now that we are entering 2018, I would like to put this model into practice, and share with you my whole journey should you feel inspired to do the same. I have to warn you, though, this is going to be a long, long read. 3 E’s Model: Engage. Evolve. Experience. I called it the critical model for living a good life because I do believe we all have to engage, evolve and especially experience as we progress in life. So what does each of the these E’s mean? Let me briefly talk about them, and get to my personal stories using them as a framing guideline. Engage refers to our proactivity and productivity, doing all kinds of personal and professional tasks. This is when we go to school, get a job, learn to cook, and make new friends, among many, many other actions we take. We have to engage to get results in life such as earning money. Evolve is technically one of the results of engaging. It means we change (or evolve) as a result of the activities with which we have engaged. If we put hundreds of hours into playing video games, we become good at it, and ultimately either waste too much valuable time or claim the title as a gamer. The idea is about who we have evolved to become after engaging with various activities. Experience in this model is the act of making sense of all the engaging and evolving. It’s about taking the time to deeply think about the gravity of the things we have done and the person we have become. This is the part that made me say this model was therapeutic. It’s emotionally healing to clearly understand how our life is progressing. This is when we get to know what the improvements we have accumulated over a period of time are, and what else we should be doing to further advance our lives positively. Unfortunately, most people, me included, don’t often do it. Before I heard about this 3 E’s model, I was so focused on engage and evolve. I always think about what I have to do and who I have to become next. Master’s degree, PhD, design and marketing company, socializing and networking, earning extra money on the side, investment, get this award or that award, and the list goes on. I felt like I was always in a race, but I didn’t even know what I was racing for. I always felt restless, and most importantly unfulfilled. How was it even possible that I did so much and still felt unfulfilled? My friend, Sophat, made me realize that I forgot to take the time to make sense of all the things I have done and the person I have become because of those things. Literally, I forgot to experience. My last end-of-the-year reflection was done at the conclusion of 2015, so I will look at all that happened in 2016 and 2017 for this reflection piece. Also, like I mentioned earlier, I’m going to use the 3 E’s model as the framing. I’m going to describe the key highlights happening after January 1, 2016. This is probably going to be a bit boring for some of you, but I’ll make it as short as possible. Then, I will take you to the evolve and experience parts where it gets a bit less descriptive, more exploratory and somewhat interesting, hopefully. 2016 was when I started driving in America. I freshly got my American driver’s license, and then drove to Washington DC with my friends. We wanted to get out of Athens, Ohio, during Spring Break and I was also invited for a TV interview about the Apple-FBI court fight at the Voice of America studio. While the travel was fun and the interview went well, I got my very first speeding ticket, thanks to those highly-sensitive speed cameras. As the trip ended, I came back to the daily routines: study, teaching and occasional lifting. Well, there were a lot of eating and sleeping in between as well. The classes I taught—including Communication Technologies and Global Media Systems—were very interesting and highly relevant to my career goals. I think I’m going to use a lot of the class materials for the job I just accepted in Washington DC. At Ohio University, one thing I was quite pleased about and humbled by was winning 1st Place for Best of Multimedia for my Master’s degree project Khmer Scholar at the 2016 Ohio University StudentExpo. 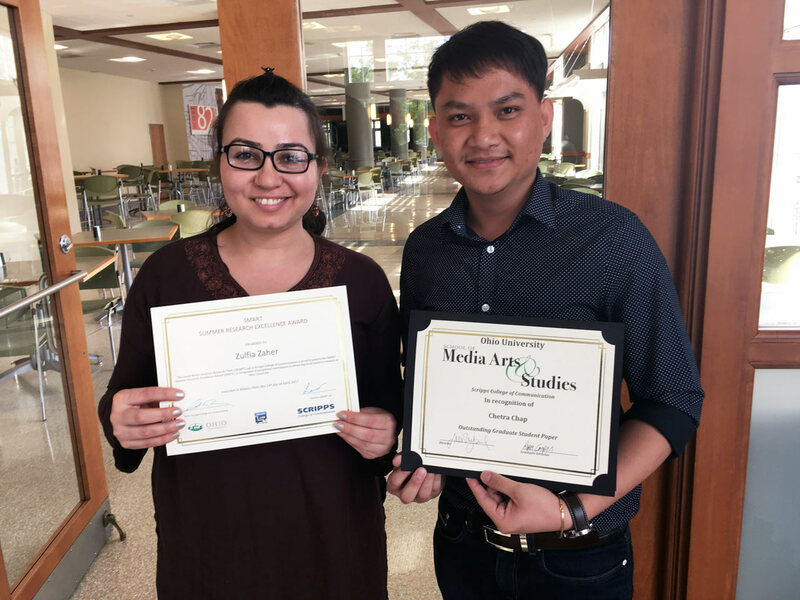 Later in August 2017, Khmer Scholar was awarded honorable mention for Best of Digital by the Association for Education in Journalism and Mass Communication (AEJMC). Khmer Scholar is not a one-person project. A number of people have contributed to building the website, and the two awards signify how much I am proud of the amazing teams, advisors and contributing scholars who have made Khmer Scholar as incredible as it is today. On the topic of awards, my good friend, Zulfia, and I participated in an Innovation Challenge, submitting a business plan for a mobile job app. We wanted to address the challenge of designing an innovative outlet (mobile and web application) aimed at college students to increase awareness and interest in broadcast and media career development. 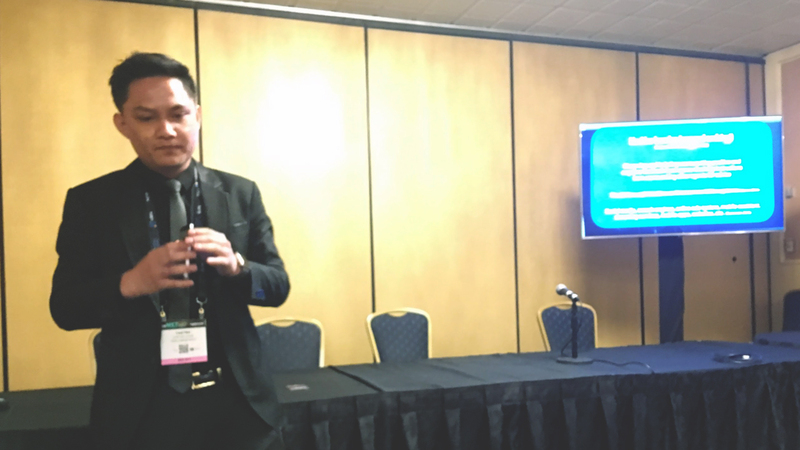 We came up with, The Bridge, a mobile and web application that serves as a one-stop shop for students and organizations in the broadcast industry to network, seek or post employments, and build broadcast-related skills. Unfortunately, The Bridge only won honorable mention for the Innovation Challenge, but later won 1st Place for Best Creative Project at the 2017 Ohio University StudentExpo. We learnt so much during the several months of working together on developing The Bridge from scratch. Things, however, got even better for Zulfia and I. At the near end of the Spring Semester 2017, Zulfia won the SMART Lab Summer Research award while I was given the Outstanding Graduate Student Paper award. Big thanks to my friends, Azril and Yiran, who helped me with data collection when I was writing the paper. As if that wasn’t enough, Zulfia got married a few months later after I came back from my trip to Cambodia in the Summer. I, as well, made the trip home to attend my sister’s wedding, which was absolutely wonderful. 2017 was, indeed, quite a heartwarming year. And it goes without saying, I just love going home. Food, family and friends are all there where it was more than perfect to celebrate my 27th birthday. A huge bonus was going on a family trip to Japan and seeing my parents struggling with the 7-hour flight. It was, after all, their first long flight. As an experienced long-flight taker, I did try to be a good son and set up a drinking session with mom and dad on the plane, which was very cool. Beer and wine to the rescue! The trip home was not just all fun and sun (seriously, it was really hot). I was quite productive. I had a chance to help the Ohio University Global Leadership Center Program where a group of 30 Ohio University students came to Cambodia to give free consultation to a number of non-profit and for-profit organizations on the various challenges they were facing. Some of the proposed solutions were so good that I adopted aspects of them in my own consulting project. That consulting project was done under my newly launched design and marketing company, Think Multiply. The project was to develop a complete unified branding strategy for one of the biggest local corporations in Cambodia. I ended up creating a package consisting of corporate philosophy and complete implementation strategies for the company. Additionally, I designed two of their corporate websites as well. It was an intense two months in Cambodia for me, but I loved every bit of it. There were two public events I very much enjoyed during my time in Cambodia, too. One was the US Embassy’s celebration of 1-million Facebook likes, where I got to reunite with my blogger friends. Yes, I was a member of the Cambodian bloggers club. We even used to fly on a helicopter together to visit a military-turned-hospital ship and came back to blog about it. Those good old days. The other public event was the major and career fair where I was invited as a speaker at the Cambodian Institute of Technology. I talked to a group of Cambodian high school students about digital media and software engineering. I was particularly careful about brainwashing the students to love Tony Stark as much as I do. Cambodia was not the only reason I got to travel. There were some academic conferences that took me to Puerto Rico, Las Vegas and Chicago to present my research papers. Finally, the biggest challenge I’m most proud of was working in a restaurant’s kitchen. As I find some free time from school during both class and break times, I forced myself to take on the most labor-intensive job I have ever had in my life. Cleaning dishes and floors, cooking some basic food, prepping meats and vegetables, and standing sometimes 10 hours straight taught me patience and endurance. I feel like I have increased my work ethics significantly from this experience. When I was writing the engage section, I didn’t realize this much had happened during a period of two years. I don’t know how I managed to pull off all those things that seemed to happen simultaneously. But I do recall furiously multitasking every day. There was this one moment of at least eight months where I worked on different things 14 hours a day and seven days a week. Who have I evolved to become at this point with all these activities? While they were good experiences I’m lucky to have accumulated, I’m concerned that I have become an extremely unfocused perfectionist. Being a perfectionist sounds like a cliché at this point. While it is commonly identified as a desirable weakness a person should possess, I start to feel that perfectionism is harming my physical and mental health. Physically, the main problem is I only slept between four and six hours a day. I checked and it’s not the right way to go at all for a person my age. I need at least six hours of sleep to have enough rest. Probably, it’s part of being in a graduate school. My peers seemed to have mentioned about having not enough sleep time as well. Mentally, I mentioned earlier that I always feel restless. I think the root cause of this restlessness is my pursuit of perfection in what I do. Naturally, I am the kind of person who embraces changes. I love the idea of embarking on new journeys, taking on new challenges and pushing my limits. Yet, perfectionism prevents me from enjoying the process of conquering changes. It creates a constant loop of worries, doubts and unnecessary fears before I actually work on those new things because I want the results to be perfect so badly. I set very high expectations and get extremely nervous to see the results of everything. I guess it’s not fun and healthy anymore if I lose sleep over it, and sadly I did. Being unfocused is another concern. As you might have noticed in the engage section, everything I did was not necessarily complementary. It’s almost as if I didn’t get my priorities straight. Why focus is extremely important, especially for me at this stage, is that I don’t have much time and energy to do everything and do it well. It’s time to focus on quality instead of quantity. I think I could have spent my time more strategically on the few things that really mattered. New year resolution detected! What did it all mean when it comes to the overall progress of my life? What did I gain and lose in those two years? It was obvious in the evolve section that what I lost in 2016 and 2017 was related to mental and physical health due to turning into an unfocused perfectionist. But I gained so much as well. First, I have grown significantly through all the activities I engaged with. I can certainly see myself with broader technical career skills set, stronger work ethics and more diverse competencies in carrying out my life such as cooking, time management and the like. Secondly and most importantly, those activities were priceless. Years from now, it’s not going to be the PhD degree or any materialistic achievements that I will be reminiscing about. It’s those individual activities that I will cherish. However, when I say activities, I specifically refer to the people I built meaningful relationships with through those activities. At the end of the day, relationship is what gives meanings to life. So far, I’ve only described the second part of this blog post’s title. The first part indicates that I’m leaving Ohio University while I have not finished school just yet. I’m done with the course requirements and passed the comprehensive exams, so that means I can work on my dissertation from anywhere. Meanwhile, I just accepted a full-time job in Washington DC which will start in January 2018. The organization I’m going to work for is a media outlet, and I hope I get to execute my plan to host a TV show there, talking about the intersection of business and technology. The class materials that I taught at Ohio University will come very handy for that plan. I’m stoked! For 2018, I’m going to right all the wrongs I committed in 2016 and 2017, straightening out my priorities and sharply focusing on only my full-time job, PhD dissertation, Think Multiply and nothing else. Also, perfectionism is going to be carefully dealt with as it can also be a powerful force for creating something unexpectedly great. Let me just try to adopt this mindset that I will strive for the good enough and then slowly work on iterating every single piece of those good enough things I will have come up with. Or I might just go see a psychiatrist. Thank you for reading this far. I wish you a Merry Christmas and a happy new year. PS: How you would you evaluate your 2017 using this 3 E’s Model of living a good life?